It was time to head back home after the partially planned journey for Christmas. I wanted to make the return trip a little exciting. I had quite some untested options available. I had ruled out flying well before the trip started - so the options were among buses. I ruled out a direct bus for some personal reasons,and finally decided to do a break journey via Coimbatore. 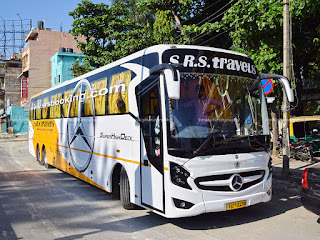 The options from Coimbatore weren't too exciting - I had two untested options - SRS Travels' Mercedes Benz Super High Deck 15M coach (which was introduced a few days before) and Madurai Radha Travels AC Seater. There was one option that I hadn't tried earlier - which was Conti Travels' Volvo 9100. After a bit of thinking, I zero'd in on SRS. The bus was quite empty when I began my searching process. By the time I reached a decision, seats were filling fast. An advertisement on their website announced that they offered a 20% discount on ticket fares for the first booking on their app. Needless to say, I downloaded the app, and made a booking through the app - the final fare was quite cheap. Then begins the next confusion - reaching Coimbatore from my hometown. I briefly romanced the idea of taking the Kerala RTC Scania to Coimbatore - but it reaches quite late for comfort, and it could turn out to be a very tight connection given the fact that road works were fast progressing on the Thrissur-Palakkad stretch. I finally dumped the plan to take the Scania, and opted for a normal bus. 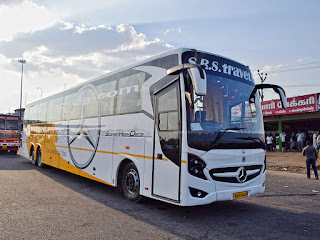 I decided to take the 0700hrs Thrissur Coimbatore Fast Passenger service - this bus has reservation facility, and this bus would also give me sufficient time to have a heavy brunch to make up for the fact that I'd miss my lunch. I reserved a ticket on the bus from a nearby KSRTC reservation counter (a counter booked ticket after a long time). The journey from Thrissur to Coimbatore wasn't very eventful - but I plan to write on this separately later. I was a bit confused with this message. I had selected my boarding point at Coimbatore Omni Bus Station. I received a call from SRS a little later confirming if I had received the message and the lady at the other end gave me a detailed explanation that the road towards the bus station was closed, and the bus wouldn't be able to reach there, and she informed that the revised pick-up point is well known among the local auto drivers. I was a little furious, but then realised there was no point being, and I appreciated the fact they called up and confirmed. I walked down to Omni Bus Station a little later to click some pics, and later took a taxi to the SRS pick-up point. I was there quite early, and had to wait for long. My bus, KA-01-AG-4335 was being prepared for the journey, while a Scania 14.5m coach of SRS was parked next to it. A message containing details of the bus and the crew was received a little past 1310hrs. The scheduled departure of my bus was at 1345hrs. Boarding started a little past 1320hrs - I chose to remain outdoors till the AC was turned on. I got into the bus as soon as the AC was turned on. Passengers were slowly trickling in, and we had to wait a little past the scheduled departure time. We finally rolled out of the parking place at 1357hrs - about 12 minutes late. The bus was a little more than 50% filled. The driver had a lot of work to steer this 15m whale out of the parking, and then negotiate the tight turns on the road that leads to Avinashi road. I was busy making my first impressions. 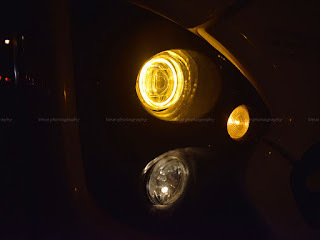 The interiors were better than what I experienced in the KPN SHD (Read here). The AC vents were perfectly placed in this bus, and the overall finished looked good, but no where close to a Scania or a Volvo. The engine was noisy and very audible inside the cabin. The ride quality was fairly good, and body roll seemed quite controlled. We rolled into Hope College bus stop by the time I settled in the bus. We started from here at 1415hrs. Pick-ups were quite quick - we were already running late, and passengers were already waiting for the bus. Inside the SRS Benz SHD..
Once on the highway, the driver picked up some pace - but remained in the range of 80s. We pulled into Karumathampatti for the next pick-up by 1439hrs - there was some confusion here, and pickup took longer. We got moving only by 1444hrs. The next pick-up was at Avinashi (1501hrs). We seemed to be running quite slow on the highway. I checked my gps repeatedly and found we were constantly in the 80s range. I assumed this could be because the bus was new, or because they wanted to extract more mileage. Since they did not play any movie on the AV system, I watched a movie on my phone to pass my time. We left the highway and entered Chithode town for the next pick-up at 1549hrs. We left Chitode after pick-up at 1552hrs. I was getting a little hungry by now, since it was close to 5 hours since my last meal. We pulled in for a break at a bakery past Vaigundam toll gate at 1630hrs - this happens to be a regular break point for most day buses operating on the route. I found this bakery to be quite normal priced - unlike the normal break points of buses. The break seemed to be quite long since the bus didn't get moving even after 15 minutes. I had a small chat with the attendant, and he was speaking about the pairing bus being stuck in traffic block - although unrelated to us, I got an indication that they were driving slow so that we meet the pairing bus somewhere en-route and they wanted to exchange the passengers. I casually asked him if an exchange was on cards - he just mumbled something and avoided answering the query. We finally start from the toll gate at 1650hrs. We continued crawling past Vaigundam as well. The body roll was quite pronounced as we took the slip road off the Salem flyover. We passed Salem town by 1725hrs - we did not have a pick-up at Salem. I was engrossed in watching a movie on my phone, and did not really notice what was going on, outside. Traffic at toll gates seemed to be really high. The first toll after Salem was a big mess. The mess got real bad at Thoppur toll - the queue was over a kilometre long. We entered the queue around 1827hrs, and we were hardly half the way at 1839hrs. The driver took a U turn just as we neared the toll gate and parked on the road side in the opposite direction. My gut feel was getting true - they were planning an exchange. The pair bus arrived a little past 1840hrs. Passengers questioned the crew about why they are exchanging, and the questioning blew up into an argument and later reached levels where a few blows were about to be exchanged. Cute ring light around the projector lamps.. Finally, people understood its of no use quarreling with the crew, who were just obeying instructions given to them from their headquarters. 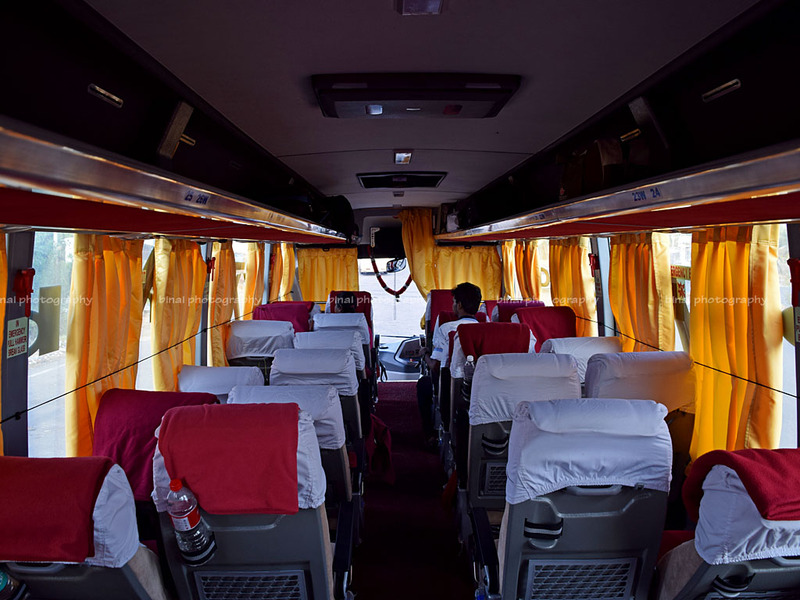 All passengers had to undergo the difficult process of shifting their baggage from one bus to the other - the crew didn't bother to help passengers with that. There were quite a few aged people, who were really finding it difficult to shift their baggage. 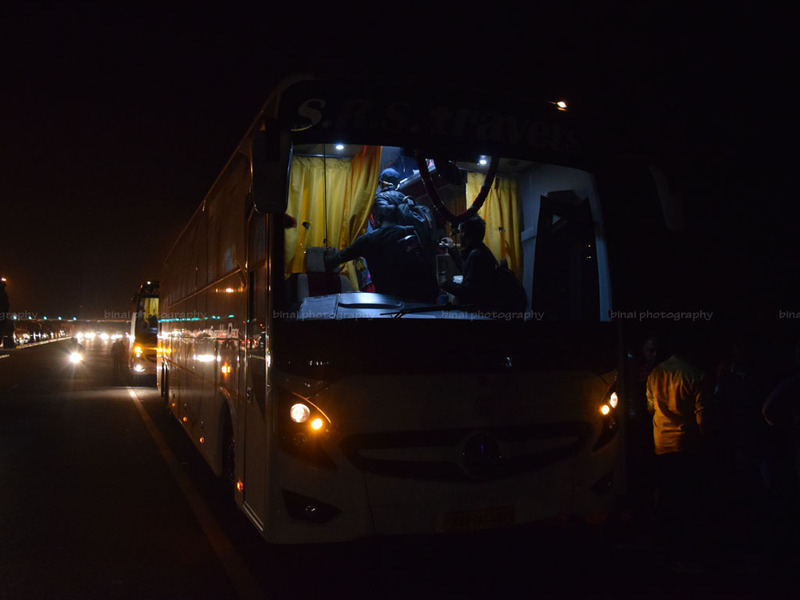 So, finally, I was on board KA-01-AG-4336, the bus which just came in from Bangalore. The crews did a quick headcount, and verified if passengers were on their intended bus itself. We finally start moving at 1855hrs. The bus ran a kilometre or so, towards Salem, then took a U Turn and returned towards the toll gate. We joined the queue again at 1859hrs, and we finally passed the toll gate at 1924hrs. The driver pulled aside after the toll gate to let some passengers use the washroom. We finally start from the toll gate at 1931hrs. We were at the same place for over an hour! This driver was ripping, and we were maintaining speeds in the range of 90~95kmph. I was hoping they would make up time and hoped to be in Bangalore by about 2200. We had a drop at Krishnagiri (2021hrs). The driver was ballistic for most of the time. I was getting more hopeful of being in Bangalore 'not so late'. My hopes were shortlasting - we pulled into Hotel Mangalam, past Krishnagiri toll, for a 'dinner' break - at 2053hrs. The crew requested passengers to return soon, since the bus was "already late". We were joined by another SRS Benz SHD, a Hebron Scania and a NWKRTC Airavat Club Class. We started off at 2104hrs. The driver stepped on the pedal after the break, again. We stopped near Hosur Flyover to drop a few passengers (2139hrs). Traffic at Attibele toll was terrible - but we still managed to pass by 2156hrs. I finally got off at Electronic City Toll gate by 2210hrs. 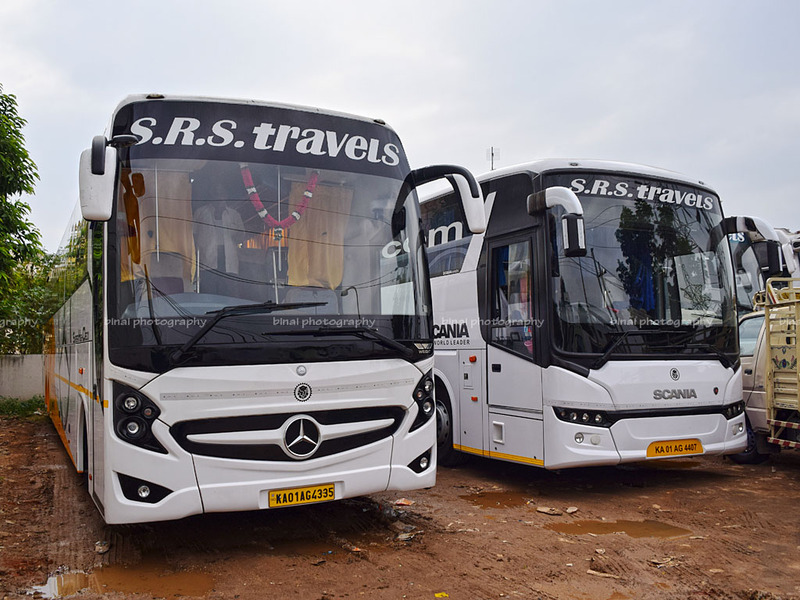 Closing Notes: Both the buses had clocked a little over 19000kms. They seemed to be maintained fairly well. The drivers didn't seem to be very happy with the bus - they were complaining about frequent breakdowns due to sensor complaints and poor quality of the body. The ride quality was good, but body roll was pronounced. The interior quality was better than my previous experience on the SHD - the finish was better. The engine was noisy - the engine could be clearly heard inside the bus. 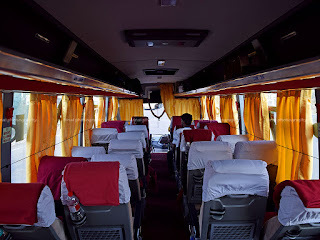 The leg room was awesome - the bus had 53 seats laid in a lavish layout. The drivers were good - they weren't rash. The bus was clean, inside out. Except the bus change incident, the experience was good. They could've avoided the bus exchange, or atleast minimized the inconvenience by helping with the baggage. They drove really slow to minimise the time lost at the exchange - that was also a stupid idea. All said, an average experience. And it looks like I have a jinx with the Mercedes Benz SHD. The last time I took it, there was a delay due to a puncture - this time for an 'exchange'. Entertainment: Available - Not Used. Will I take this service again? Will surely try them again, the next time.